There have been some lovely posts over the last few weeks with vases of flower arrangements on a Monday – organized by Cathy at Rambling in the Garden. This entry was posted in Days, Garden and tagged Cut Flowers, Garden, Spring. Bookmark the permalink. Oh Cathy, this is so pretty! I can’t ever get enough of that shade. Thanks for also providing the links to Susie at pbm.garden. Since we share the same name, and some of the same propensities, I will check out her site and follow her too. Hi Susan! I’m glad you’ll visit Susie. She is very talented at arranging her flowers, whereas mine really were just “put” in the jug and that was that! LOL! Have a nice week! What a charming photo. I love the mix of old and new. I’m also extremely partial to purple. That is a neat idea, posting vases on Monday. I’ll go check out the other two links. I also think it’s a lovely idea to fill a vase with flowers from your own garden every week… I don’t think my garden will produce much more then a posy before Easter though! I know what you mean. I’ve often dreamed of a cutting garden. One summer two years ago I grew the most spectacular cosmos. I can take no credit, as I believe they were planted by squirrels. They made gorgeous arrangements though, and continued to produce for weeks. Very pretty, Cathy, just putting some pretty flowers in a lovely vase is perfect! Me too! Daffodils are better like this. They are one flower I really don’t like ‘arranged’. Your violets are very pretty. And the vase is just right for showing them off at their best! Thanks Sarah – makes a change from the tulips bought at the supermarket! This is so pretty, I love the vintage vase and story. And it really is a simple as that – and what pleasure it will give you, particularly using your Nanna’s vase 🙂 How long would you expect the violets to last? Thanks you so much for joining in and do come again! And thank you for hosting Cathy. I don’t suppose the violets will last more than a few days, as it’s quite warm again here. I can smell the scent! Thank you. You’re welcome Uta! The creamy yellow violets are open today too! Oh very pretty Cathy! Love your vase, very beautiful too! Rainy and cold here today! Did you see my post today, Hot Fudge Cake? What a lovely contribution Cathy. 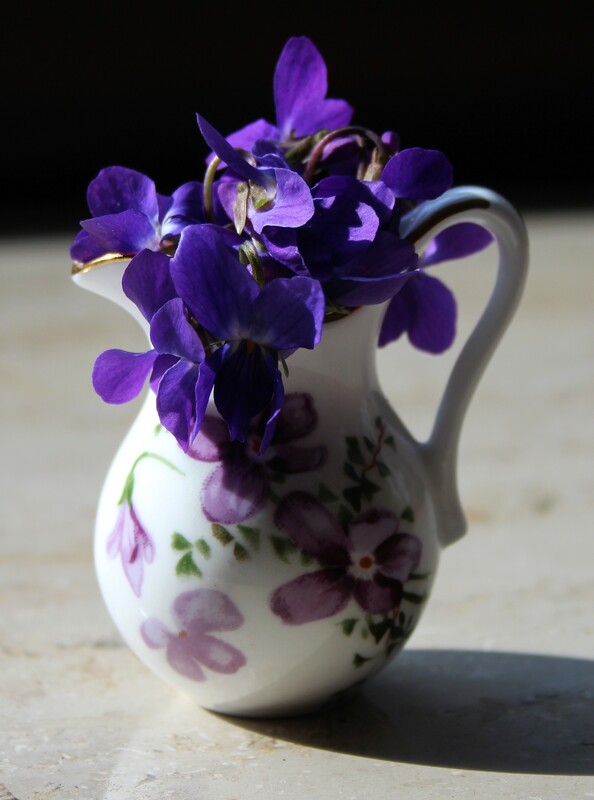 Your jug looks perfect filled with violets and how lucky you are to have inherited it from your grandmother. It’s the only time of year I ever think to put anything in that jug. LOL! Have a nice week Julie! A very lovely picture “Blue violets in Nanna´s vase”! I like it – gives to me a romantical, and nostalgic feeling.. It does look quite old-fashioned and nostalgic, yes. I hope they last a few days, but there are still many more in the garden! Beautiful and even more lovely in a vase with special meaning to you. I will have to make an effort to find more flowers to cut this year. Thank you for inspiring me Susie! This is just lovely, Cathy, and the flowers suit the vase perfectly (and vice versa). The scent must be great. Look forward to more of your creations! I will try to do this more often – maybe I’ll have enough daffodils by next week…. can’t wait to see your meadow! Thanks Debra. Violets are that kind of flower aren’t they… reminiscent of times gone by.